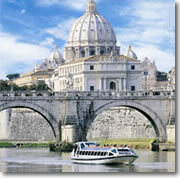 Battelli di Roma Tiber river cruise in front of St. Peter's. After more than a century of pretty much ignoring the Tiber (building high embankments seems to doom all urban rivers to such mental neglect), Rome now has a river cruising service like those in Paris and London. Not that is it anywhere near as good as those in Paris and London—the tall 19th cenury embankments flanking the Tiber in Rome hide much of the city from view, and the commentary on the day cruise is pretty canned. However, it does make for a rather different take on the Eternal City, and a bit of a relaxing hour away from the relentless sightseeing of ancient ruins and Old Master art decorating the countless churches and museums. The new rubber raft tour is intriguingly original as well. 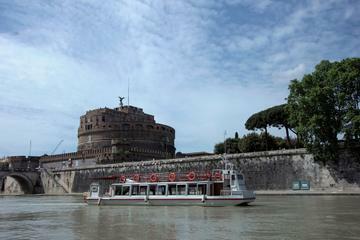 Discover Rome with a hop-on hop-off cruise along the Tiber River. An easy and convenient way to experience the Eternal City, this cruise allows you to visit some of Rome’s most noteworthy attractions, including the Colosseum and Vatican City, while offering exceptional views and informative commentary. 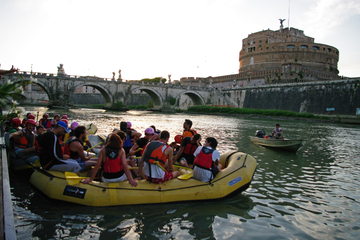 For the first time in Rome a urban ECO-Friendly experience on the Tiber! The Tiber is the heart of the Eternal City, used for thousands of years to transport whatever Rome needed: food, wine, and wheat, but also art, obelisks, and statues. From the middle ages on, the Tiber was used to power the water mills to make flour. Its beaches served until the end of the XIX century as piers. This tour gives you the opportunity to rediscover the Tiber and see Rome with the eyes of a visitor of over a hundred years ago. 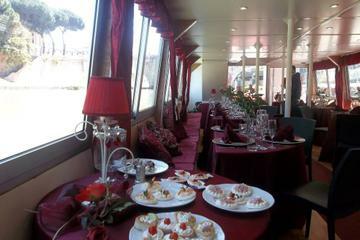 In addition to those exciting new rubber boat tours of the Tiber (which put in near Piazza del Popolo and come out near Campo dei Fiori), Battelli di Roma offers two evening crociere (cruises)—the 6pm with wine and cheese, the 9pm with a full dinner (for those, arrive 20 minutes early)—plus a 24-hour hop-on/hop-off boat serivce up and down the Tiber River (Fiume Tevere) in a one-hour loop accompanied by recorded info on what you are passing blaring in 7 languages. The main embarkation point for the cruises is Ponte Sant'Angelo, in the middle of the route, across the river from Castel Sant'Angelo, just a few yards upriver from the bridge itself—more specifically, along the Lungotevere Tor di Nona between where Via del Mastro and Via della Rondinella hit it. 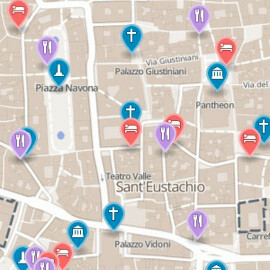 There's another stop across from Tiber Island (on the southern, Trastevere bank), on the Lungotevere degli Anguillara between Ponte Garibaldi and Ponte Cestia. In summer, other offers are often put on board, like weekend cruises all the way down the Tiber to the ruins of Ostia Antica. Check the (poorly updated) website for details.